Yes, AOC does weekend brunch, and it's really good. I had grilled asparagus with spring vegetables, soft-cooked egg, and parmesan polenta. 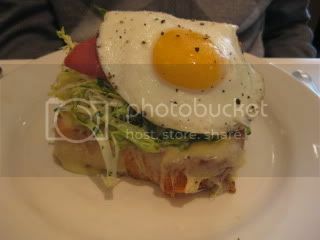 Jason had toasted brioche with gruyere, prosciutto, frisee, and egg. My dish was really nice. The vegetables were so tasty, and kabu (turnip) had a especially nice flavor. I can always rely on their food quality. I think AOC is one of no-so-many consistent-quality restaurants over many years in LA.